The celebration of the name day for the church of Theologos is hold twice a year and you get served traditional food. Celebration of Klidona "Midsummer" with traditional music and dance. Celebration of Klidona “Midsummer” with traditional music and dance. The celebration takes place in Tholaria in the north part of Amorgos, is the name day of the church. The hole village is full of people who eat, play traditional music and dance. The celebration of the church Agia Paraskevi which is located in the southern part of Amorgos in Arkesini is the biggest festival in Cyclades and attract visitors from all over the world. The preparations begin 10 days before the celebration and on the 25th in the evening the famous “patatato” is prepared for the next day. The 26th is party on for full with food, local music and dance. Agia Paraskevi in numbers: 4000 people, 100 volunteers & 150 goats. Psimeni Raki festival takes place on July 26 every year in Katapola’s main square. You have the opportunity to see up close how this excellent beverage is made. Psimeni raki is still done in the traditional way by the island villagers and its repuitation has spread throughout Greece. The celebration continues by welcoming a boat carrying young dancers wearing traditional dresses. They are received by local musicians and the dancing starts. Psimeni raki is offered along with local delicacies such as Pasteli (local sesame seed candy with honey) and Anevates (pie with cheese and Raki). You can join the dance and the party goes on until until the next morning. One of the biggest feasts on Amorgos, "The Transfiguartion of Christ". It is celebrated with wine and live music. One of the biggest feasts on Amorgos, “The Transfiguartion of Christ”. It is celebrated with wine and live music. A big festival in honour of Panagia Panochoriani. A feast with traditional local dishes, drinks, live music and dance. Xerotigana is the traditional sweet of Amorgos – it is also used in other Cycladic islands – made for Christmas and Easter, but also offered in weddings and baptisms along with traditional pastels. 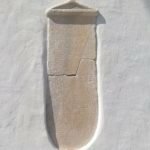 A reference point to the local tradition of Amorgos, the Xerotigana, accompanies every joyful moment in the life of the Amorgians. Every year in the summer the Festival of Xerotigana is organized. Visitors can watch the preparation process, try psimeniraki and dance along with the locals to the traditional local music. The festival is hold in the really north end of the island and it’s about 2 hours walk from Langada. But it is worth to go there for the magic and beautiful place and then you get served the traditional Amorgian patatato, goat with potatoes. The celebration of the name day for the church of Theologos is hold twice a year and you get served the traditional food. Amorgos is a magic place during Easter, some customs are still celebrated from the Byzantine period. On the Good Friday the scent of sage and oregano will be all over the island, spread spread on the streets which is light up by candles when the “Epitaphios” passes. On Easter Saturday at midnight the liturgy ends with blessing and lightning of the “lambadas” (Easter candles) then everyone go outside to enjoy the fantastic fireworks. The fast breaks in the night with the traditional soap “Mageritsa”. The Easter Sunday brings a special sense of Amorgos when everyone has the goat turning over the fire. In the afternoon people are gathering in the village for the burning of Judas and the children are participating in traditional games. 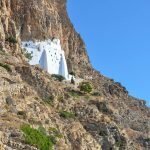 The third Amorgos Trail Challenge is here! 18 km race start at the Monastery of Hozoviotissa and the finish in Aegiali Bay. AMORGOS MUNICIPALITY welcomes you to our island. With this tourist guide, we want to make it easier for you to plan your travel to and vacation on Amorgos. 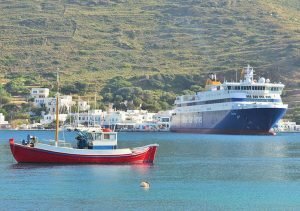 How was your experience of Amorgos ?